Western blot analysis of extracts from PANC-1, HeLa, and C2C12 cells using Argonaute 3 (D15D2) Rabbit mAb. 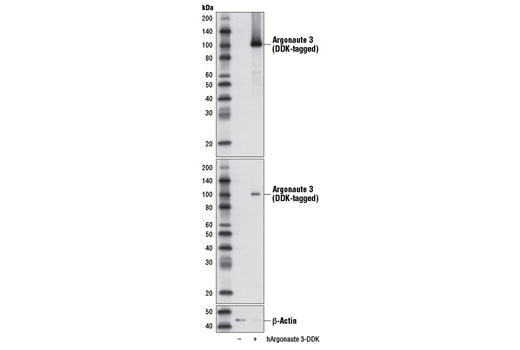 Western blot analysis of extracts from 293 cells, mock transfected (-) or transfected with a construct expressing DDK-tagged full-length human Argonaute 3 (hArgonaute 3-DDK; +), using Argonaute 3 (D15D2) Rabbit mAb (upper), DYKDDDDK Tag (9A3) Mouse mAb #8146 (middle), and β-Actin (D6A8) Rabbit mAb #8457 (lower). 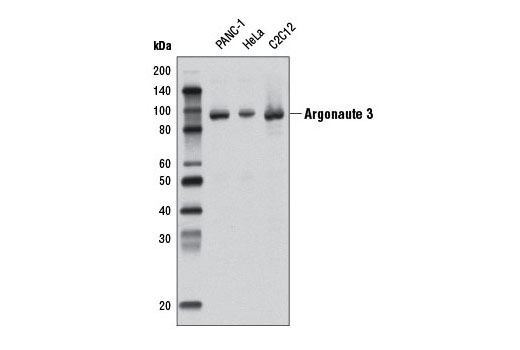 Argonaute 3 (D15D2) Rabbit mAb recognizes endogenous levels of total Argonaute 3 protein. Monoclonal antibody is produced by immunizing animals with a synthetic peptide corresponding to residues surrounding Val160 of human Argonaute 3 protein.